Thanksgiving is notoriously known to be the most annoying time to travel. It’s the holiday with the highest travel prices - even higher than Christmas or at the peak of summer. This is due to a steady increase of travelers - this year, 54.3 million Americans are expected to travel for Thanksgiving. Since the holiday falls in November, weather regularly causes delays in both airports and roads. Every article on how to avoid some of the annoyance will tell you to be prepared and to leave early - undeniably sound advice. 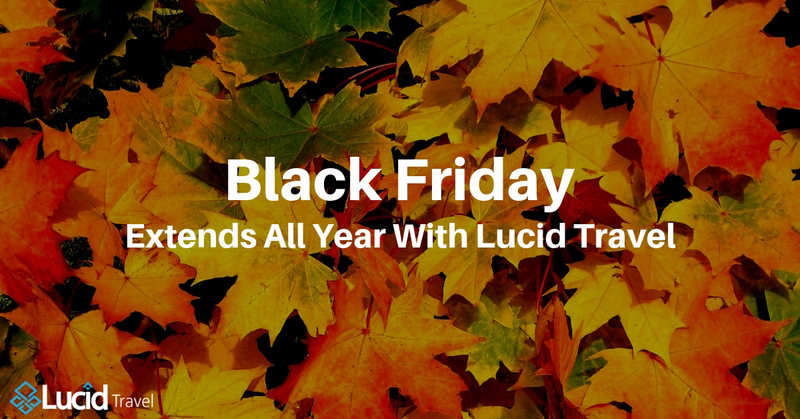 But this week Lucid Travel will focus on the holidays immediately after Thanksgiving: Black Friday and Cyber Monday. Both offer deals for travel in addition to deals on any other consumer goods. Most people wait all year for this special rates occasion. Luckily, Lucid Travel can help you in your Black Friday search for deals by pulling out the best rates available for you. Even better is that finding the best rates possible are Lucid Travel’s specialty. You can be guaranteed to find the best rates available any time of the year, not just on Thanksgiving week. That’s something to be thankful for.